Seed syllables (Sanskrit bījākṣara) are the quintessence of mantra, and the ultimate condensation of the Dharma, containing infinite meaning in a single syllable. Oṃ has held a special place in Indian religion since before Buddhism. Other seed syllables were elaborations of the first letter of a deity's name elaborated with the anusvāra and/or the visarga. In Buddhist tantra the Buddhas and Bodhisattvas are each associated with a seed syllable. I've included some seed words which are more than one syllable, but which function in a similar way to seed syllables. If the seed syllable you are looking for is not in this list, try the figure that it is associated with. For instance loṃ doesn't have a separate page, but there are examples on the Locana page. The mother of all written and spoken syllables. 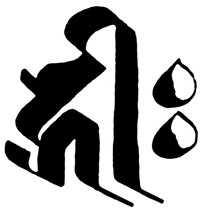 A is the seed syllable for Mahāvairocana. 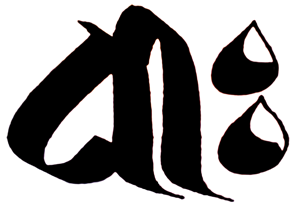 āḥ is the seed syllable of Amoghasiddhi. It also occurs in the combination oṃ āḥ hūṃ. dhīḥ is the seed syallable of perfect wisdom. It is associated with Mañjughoṣa & Mañjuśrī and also with Prajñāpāramita. see also my essay The Seed Syllable of Perfect Wisdom. hūṃ is frequently the last syllable of a mantra. It is particularly associated with Akṣobhya, Vajrapaṇi, and with Vajrasattva. How to write the hūṃ seed syllable in Siddhaṃ. hrīḥ is the seed syllable of Amitabha. maiṃ (rhymes with sign) is the seed syllable of Maitreya. This syllable can be written in two different ways in Siddhaṃ. tāṃ is the seed syllable of both Green Tārā and White Tārā. Tārā is known in Tibet as the mother of all the Buddhas. There is an interesting relationship between the body of White Tārā, and the form of the tāṃ in the Siddhaṃ script which you can read about on White Tara, tāṃ, and the Mandala. These are words which do not quite fit the definition of being a seed syllable, but which function in more or less the same way. phaṭ is a very ancient Indian magical word. "This one word hūṃ represents the religious persons, causes, practices, and attainments of the Three Vehicles with nothing left out" - Kukai, Ungi gi.